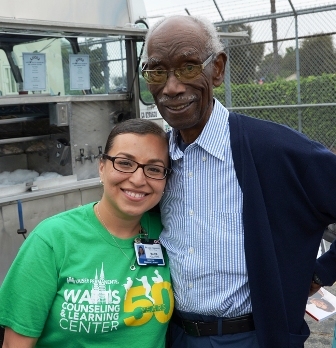 On June 7 the Kaiser Per­manente Watts Counseling and Learning Center celebrated 50 years of service to the Watts community with a Grand Open House. The Center opened two years after the 1965 Watts civil unrest to provide essential mental health and educational resources to children and their families. Half a century later, what began in a small room in a prefabricated building with three employees has grown to a 9,000 square-foot facility with a team of 30 therapists, teachers, counselors and other staff members. Since its founding, the Watts Counseling and Learning Center has continually expanded and diversified its programs to cover a wide range of culturally relevant mental health, educational and youth outreach services. The Center is funded by Kaiser Permanente Southern California as a Community Benefit program. Families do not need to be Kaiser Permanente members to utilize the Center’s services. Katrice Jackson, a licensed clinical social worker at the Watts Counseling and Learning Center, says she is living proof that the Center is accomplishing its goals and changing lives. She grew up in Watts and now works at the Counseling and Learning Center with children and their families providing mental health therapy. In honor of the Center’s founder, Bill Coggins, the Watts Counseling and Learning Center also awards scholarships to college-bound high school seniors for exceptional service to their local communities. For more information about Kaiser Permanente Southern Cali­fornia, follow us on twitter @KPSCALNews or go to: share.kp.org/scal.